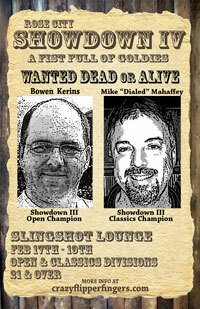 The fourth annual Rose City Showdown takes place this weekend, February 17 through 19, 2012 at the Slingshot Lounge (5532 SE Center). Rose City Showdown is a HERB style qualifying PAPA style finals tournament consisting of two divisions, an open division on 6 machines and a classics division on 4 machines. Top 16 from open will make the open finals and top 12 from classics will make the classics finals. Tickets are $3 each or four for $10 and can be used for either division. All money collected will be paid back as prizes! Friday competition hours are noon until 2am, Saturday noon until midnight. Sunday the classic finals begin at noon, followed by the open finals. For more information visit Rose City Pinball and Crazy Flipper Fingers.